"He's a good guy who plays hard cricket." The third Test between Windies and England in St Lucia is a dead rubber after the former took a 2-0 lead, winning the first two Tests in Barbados and Antigua respectively. However, the Three Lions have managed to come back strong and are currently leading by 448 runs at the close of play on the third day, courtesy of skipper Joe Root’s masterful knock of 111 from 209 balls. 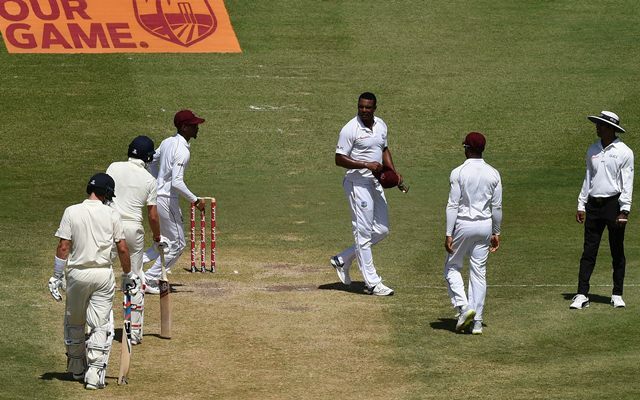 The knock might have ruffled feathers of a few Windies’ players, one of them was definitely fast-bowler Shannon Gabriel, who called the English skipper a ‘gay’. Thereafter, the on-field umpires in Rod Tucker and Kumar Dharmasena warned the 30-year-old right-arm pacer for using the abusive language after a confrontation with the English middle-order batsman. Root was a tad surprised by the rather harsh words. Nevertheless, he didn’t die wondering and he retaliated, saying: “There is nothing wrong with being gay.” The stump-microphones caught their conversation. However, the ICC match officials didn’t hear anything that would fall under the International Cricket Council’s (ICC) anti-racism code. “Sometimes people say things on the field that they might regret, but they should stay on the field. It’s Test cricket and he’s an emotional guy trying to do everything he can to win a Test match. He’s a good guy who plays hard cricket and is proud to be in the position he is. The battle was a good contest, he’s had a wonderful series and he should be proud,” Root mentioned to the reporters. Nonetheless, Richard Pybus, the Windies’ interim coach, said that he wasn’t aware of such comments, but remarked it would be addressed if they are deemed ‘untoward’. “Nothing has been reported to me. But if a comment was made, we’ll review it. And, if it was untoward, we’ll be addressing it,” he said.